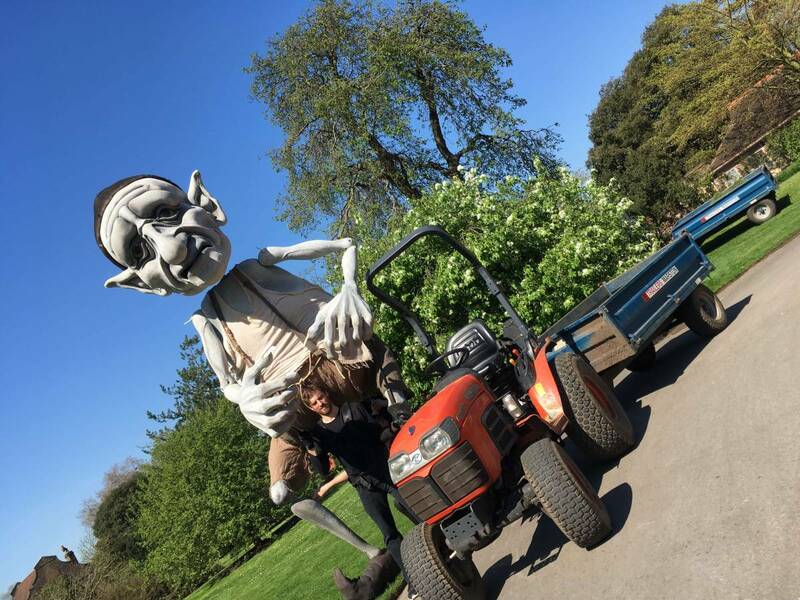 Gnomus the giant caretaker of places and stories, who unearths unknown facts about places of interest and outstanding natural beauty, engaging family audiences through a devised site responsive big puppet spectacle. 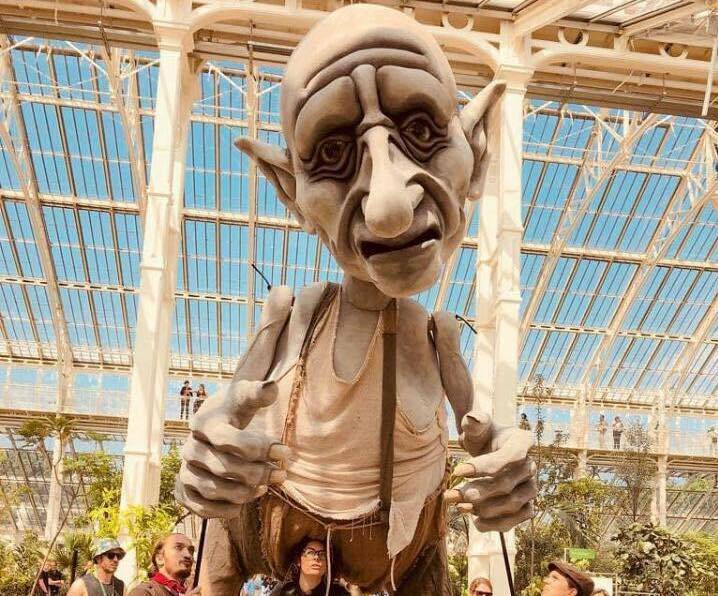 After a successful run 52 day at Kew Gardens this year, Gnomus is available for touring in 2019 and beyond. We are seeking conversations with programmers about Gnomus and how he might engage with a local landmarks, historic buildings, heritage sites, botanic gardens, and similar locations as a site responsive work. 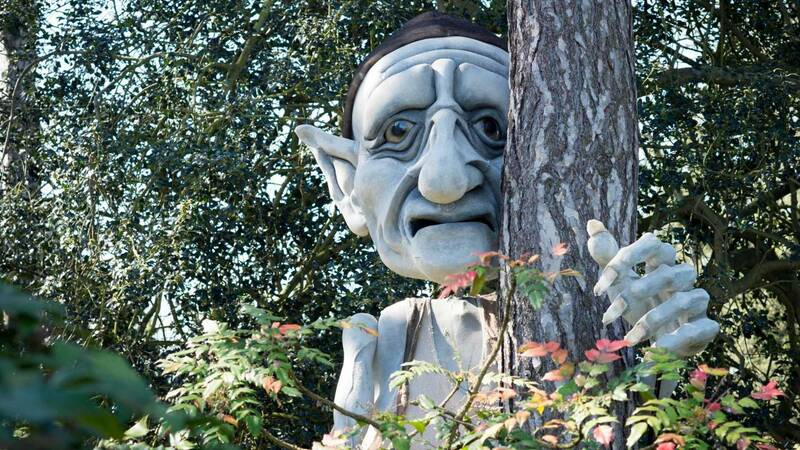 Gnomus is also available as a walkabout act where he characterfully interacts with family audiences. 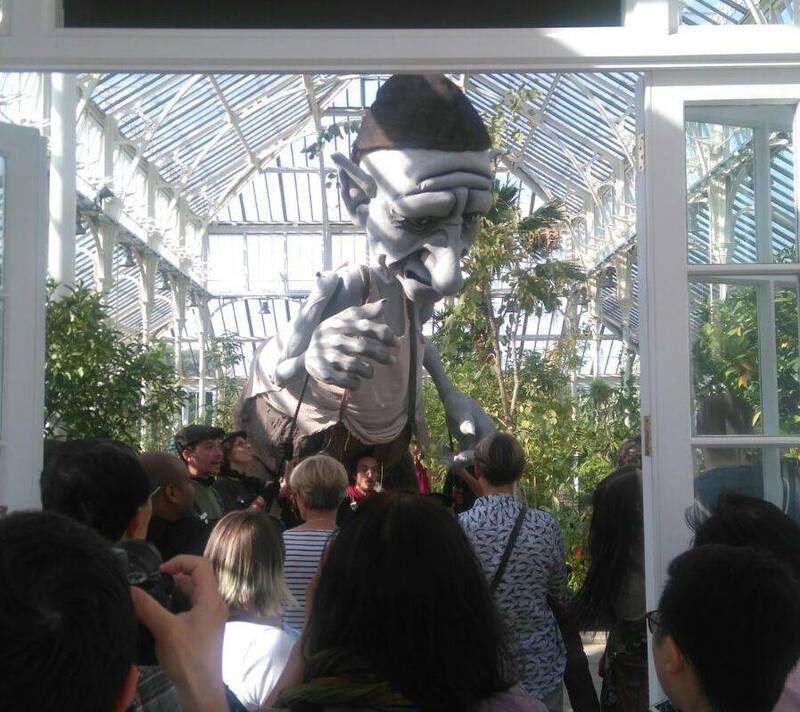 Each bespoke, site responsive work uses the performance structure created for 52 days of shows at Kew Gardens in 2018, including Gnomus – an eccentric bumbling character; a large 4m high bunraku puppet, operated by four puppeteers. Alongside Gnomus is a human tour guide character who performs on a 2ft stand. Both Gnomus and the Tour Guide each have four mini rig speakers for vocal amplification and both are very mobile. We then consult with local experts about the chosen site and devise a responsive script. The performance outcome can be up to 6 x 15min walking tours of the site during the festival or event that engage directly 40 to 150 family audiences per performance and many more indirectly. We seek to find interesting and unknown ideas about the site’s past and present, how and why it was built, interweaving stories of how the site has been used, and finding a contemporary context for the work. Each site-responsive commission requires two weeks in total to create this work, broken down into one week of consulting, devising and writing, and a week of rehearsal with puppeteers and creative team. 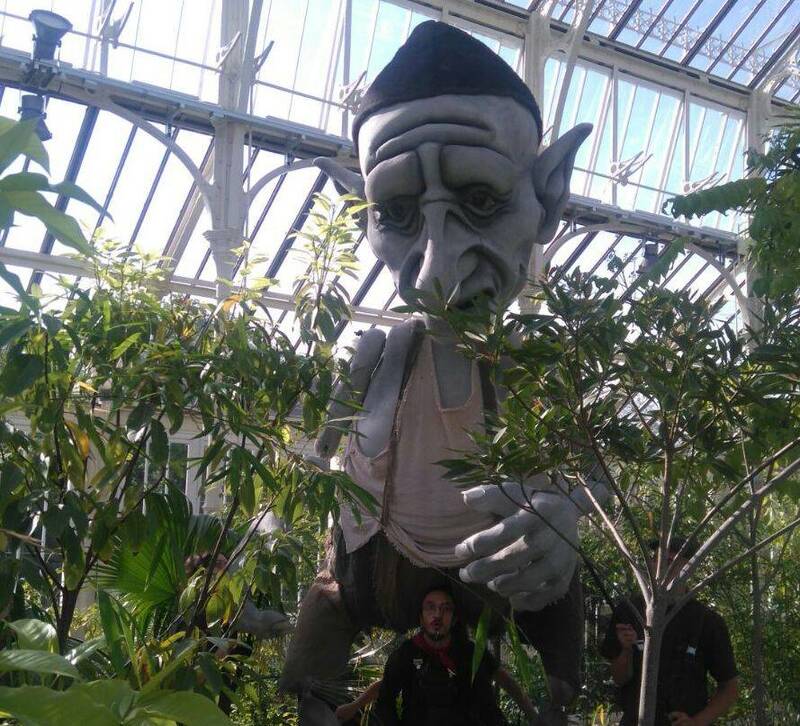 Previously Gnomus was presented at Kew Gardens as part of a Temperate House commission and completed 52 days (7 days per week) of shows, engaging over 35K family audiences with themes of extinction, the challenges plants face in the Temperate House collection and compelling a new generation of environmentalists. PUPPET MAKERS- Charlie Tymms, Maia Kirkman-Richards, Oli Simonon, Seb Mayer, Jo May, Caroline Bowman. Gnomus was first commissioned for the 2017 BBC Ten Pieces Prom at the Albert Hall, a classical, contemporary and new music initiative that has musically, theatrically and interactively engaged four million young people around the UK over four years. Nick Barnes Puppets asked Puppets with GUTS to collaborate on developing Gnomus, which was a response to a Mussorgsky piece of the same name, and draws inspiration from Arthur Rackham’s illustrations, with a touch of Tim Burton! During this initial commission process, an educational and engagement project was delivered to young people at Fox Primary school, who where able to contribute to initial designs and performance ideas, helping to bring Gnomus to life. 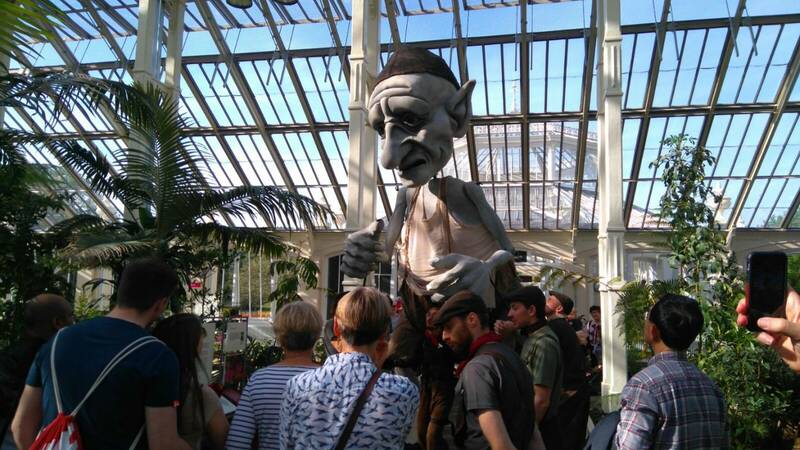 Following on from the BBC commission, in 2018 Gnomus was further developed from a two to four-person puppet for a summer commission at Kew Gardens, delivering 52 continuous days of intensive performance. 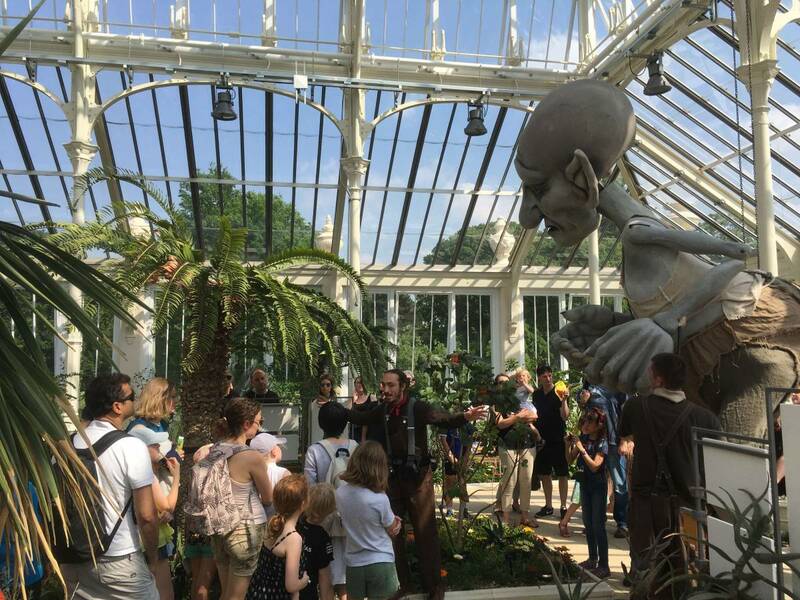 Gnomus led a characterful and dynamic big puppetry performance to a diverse family audience, exploring the Temperate House collection and highlighting the issues facing plants and fungi. The result is a characterful puppet spectacle, through which different narratives are told. The elements of the show include the four-person bunraku puppet Gnomus, an outside tour guide character called “Robin”, two wearable amplified sound systems and a small mobile performance pedestal. 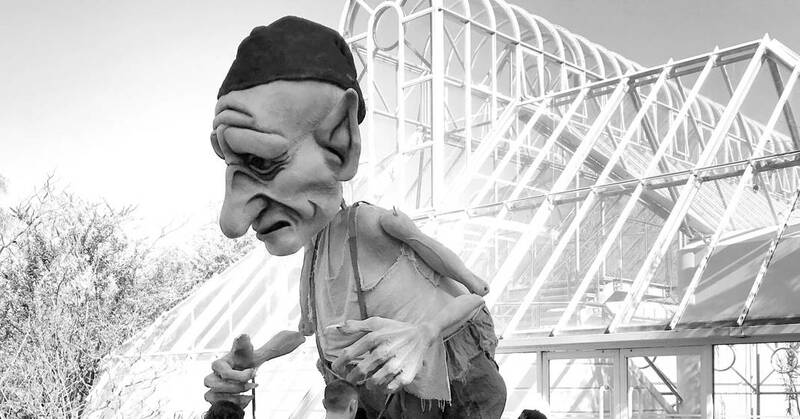 Looking ahead, Gnomus can be commissioned to respond to different outdoor sites and engaged as an eccentric storyteller for daytime or night-time performances. Originally commission for the BBC Learning Department for the BBC Proms Ten Pieces 2017 and is a collaboration between Nick Barnes Puppets and Puppets with GUTS, and then recommissioned for Kew Gardens in 2018.